Many communities across the country often rely on a large, single employee to provide good-paying jobs and job security. But as we’ve seen time and time again, eventually these employees close up shop, moving elsewhere or shutting down completing, leaving the community without an economic driver. 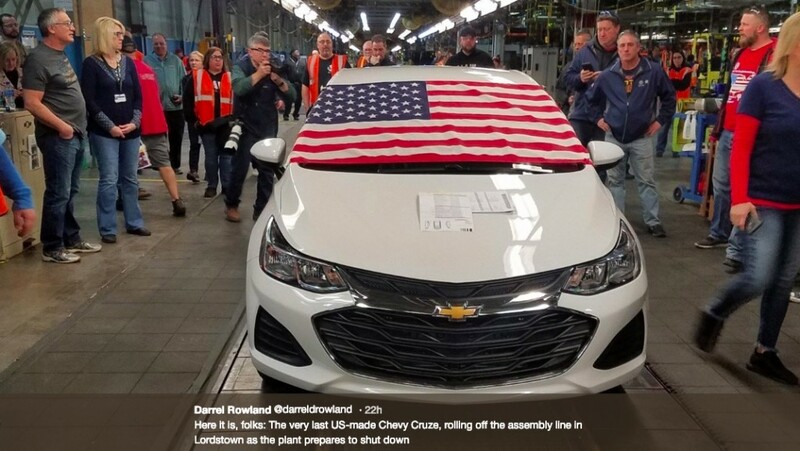 That is what could happen in Lordstown, Ohio as production at GM’s Lordstown factory ends. According to a report from CNBC, the local economy could lose as much as $3 billion this year alone with the plant sitting idle. At its peak, Lordstown employed 10,000 people. The factory opened producing the Chevrolet Impala on April 28, 1966, when the first example rolled off the assembly line. Since it began operations, employees at Lordstown have built the Chevrolet Vega, Cavalier, Cobalt, and, most recently, the Cruze. It’s producing 16 million vehicles since 1966. However, things began to sour at the plant in April 2018 when GM announced it’d cut second shift and eliminate 1,500 jobs. Slow Chevrolet Cruze sales are taking a toll on production at the factory, with General Motors selling about half the Cruzes it did when compared to 2014. Sedans of all sizes are falling out of favor with Americans, forcing companies like General Motors and others to reassess the importance of even offering such models that already have thin profit margins. The final nail in Lordstown’s coffin came in November when GM announced it’d idle production at the plant in March, which has already happened. The future of the plant remains uncertain until later this year when General Motors will meet with the United Automobile Workers union to negotiate a new contract while determine the determining the future of Lordstown and the three other U.S. plants GM wants to idle. The delayed negotiations have U.S. President Trump angry, tweeting earlier this week he wants negotiations to begin immediately. The ripple effect of lost jobs can cripple a community. This area has been crippled since the Carter admin when the steel plants closed. GM has been up and down here as this plant is only half what it once was. Shale drilling has spured much growth here but the union and union thinking of msny ex steel families have driven the jobs south to non union plants. Most of these union workers if they have any time will go to other plants near by and bump new workers. My short time in a union shop ended when I got bumped. I decided then to move on as they to,d me I would need to expect lay offs till I at least got 15 years in. Well that plant went away because the union priced them self’s out. Electrical workers screwed me and some of my buddies. The United rubber workers screwed my grandfather then screwed themselfs out of business as the rubber companies all sold out to foreign companies that went south to non union plants. “Electrical workers screwed me and some of my buddies. The United rubber worker screwed my grandfather then screwed themselves…” – that explains a lot. TMI but we understand you better now. You need more help than you can give. Any time GM ” idles ” a plant it has a devastating effect on the local economy . Finding a new job at a different plant is a huge disruption for the families that will have to decide if its worth moving , its a tough choice to make .